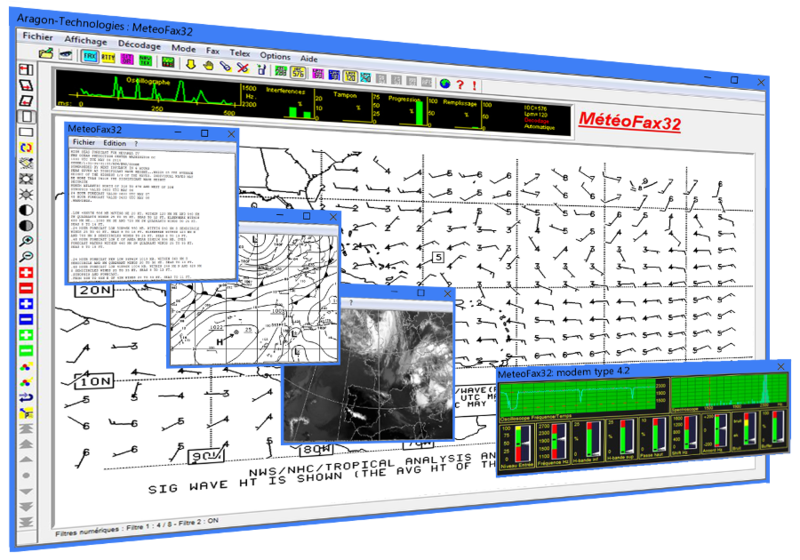 MeteoFax32: Weatherfax or radiofax, Rtty, Sitor, Navtex decoding software. GUI in English and French. - 1 PC or Mac Intel with Windows XP/Vista/7/8/10 32 or 64 bits and a 500 MHz or more processor. - 512 MB of memory or minimum required by the operating system (512 MB for XP, 1GB for Vista 7 8). - 1 free RS232 port or 1 free USB port. - 1 SSB receiver or transceiver with 0.1 kHz steep synthesizer capable of proper reception of the signal in the planned navigation area and equipped with a headphone or external loudspeaker jack. System compatible with remote receivers (eg Icom PCR 1500/2500). - Accepted protocols : Weather Fax (radiofax), RTTY, SITOR, NAVTEX. - Software and documentation language : English and French. - Free reception of meteorological information transmitted as weather charts, forecast winds, sea conditions, satellite photos and telex in RADIOFAX, RTTY, NAVTEX and SITOR mode from a PC and an a SSB receiver. - Fully automatic Software easy to use. - The modem has a special narrowband and steep slopes filter associated with a high input dynamic range and excellent linearity VCO and an analog / digital synchronized converter controled by a microprocessor. - Automatic detection of the modem on RS232 (serial port COM) or USB port with no configuration necessary. - The rate of rejection of interference and noise of all kinds is further enhanced by the use of a dual digital processing device performing an adjustment for graphics pixel by pixel. - Decoding text modes with automatic frequency control, catching clock for the reception of NAVTEX and SITOR messages even in the absence of synchronization header. Configuration of start and stop strings for RTTY and SITOR filtering messages. Selection of stations and message types in NAVTEX mode. - Decoding mode and format of documents selected in order to obtain reliable use even unattended. - Software optimized for running in the background without disturbing navigation software running in the foreground. - Can display documents received even while receiving another document. Displaying of documents as discrete thumbnails when use in background. - Colorization of documents for better readability of satellite pictures. - Automatic saving of graphics and text documents and management of an archive of the last 20 fax documents received with date and time of receipt. Configuration of the volume of storage of text documents. - Document printing and export to any other application. - The software has a database of frequencies and schedules of all stations in the world. - Easy installation of the program and the modem. - GUI and documentation languages: English, French. Free assistance and technical support.